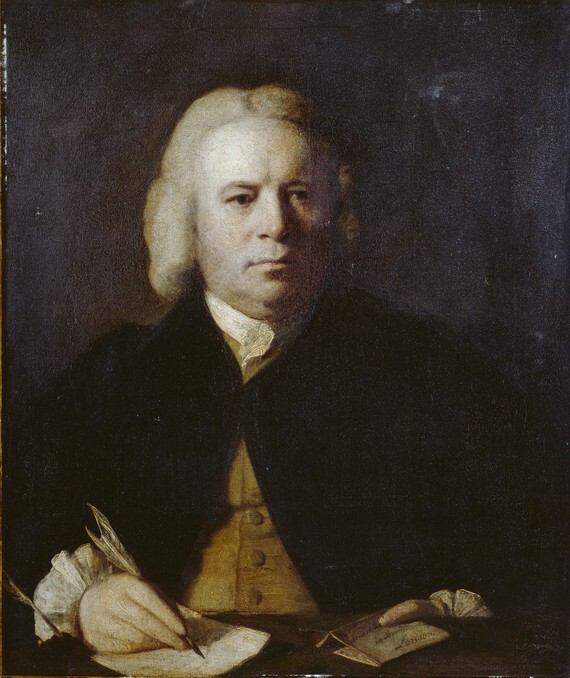 There is a lovely portrait of Robert Dodsley (1704-1764), one of the most important bookseller/publishers from the period, and who was also a writer. Dodsley was the instigator of Dr Johnson’s Dictionary (1755), and he also published Robert Lowth‘s Short Introduction to English Grammar (1762). What I think is most striking about the portrait is that he let himself be painted as a letter writer, even in the very act of letter writing: there is a bottle of ink in the left corner, and there is a finished letter (a letter he recieved?) under his left hand. This must be significant, particularly in the light of Susan Whyman’s study of middle and lower-middle class letter writers (for her book The Pen and the People, see elsewhere in this blog). Dodsley started his career as a footman, and we know next to nothing about his education. But he did become one of the most important publishers of the age, and letter-writing must have played an important role in this. Dodsley kept a file of the letters he exchanged with his authors, including Robert Lowth, with whom he developed close friendship. The letters were published in 1988. They give a fascinating insight into the history of eighteenth-century publishing. Tierney, James E. (1988). The Correspondence of Robert Dodsley 1733–1764. Cambridge etc. : Cambridge University Press. This entry was posted in letter writing and tagged Robert Dodsley, Susan w, Susan Whyman. Bookmark the permalink.